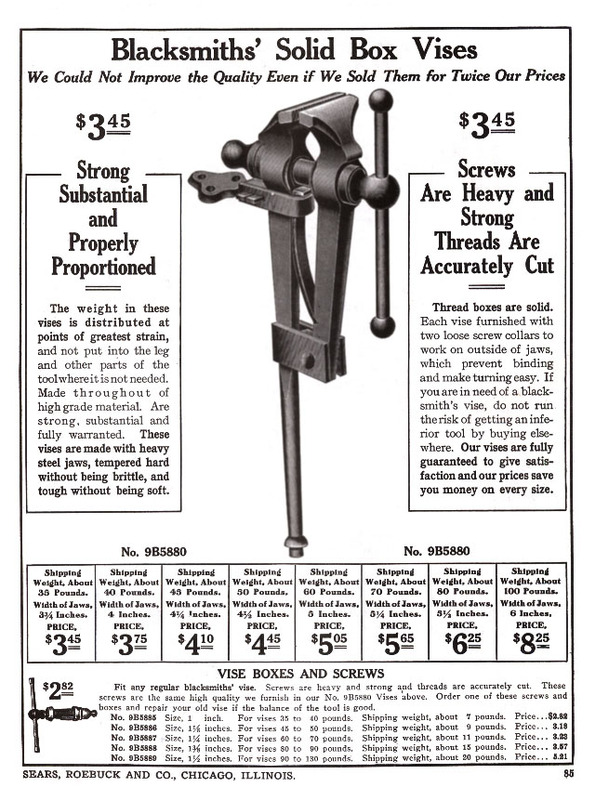 1915 Catalog. 148 pages including index. This is one of hundreds of Sears toll catalogs that would follow. My copy is a 1985 reprint by the Mid-West Tool Collectors Association and ABANA. It replaced the spring edition of the Anvils' Ring. Previously it had been reprinted by the Mid-West Tool Collectors Association in June 1984. Page 85, Blacksmiths Solid Box Vises. The lack of any branding on this ad indicates just how standardized leg vises had become. 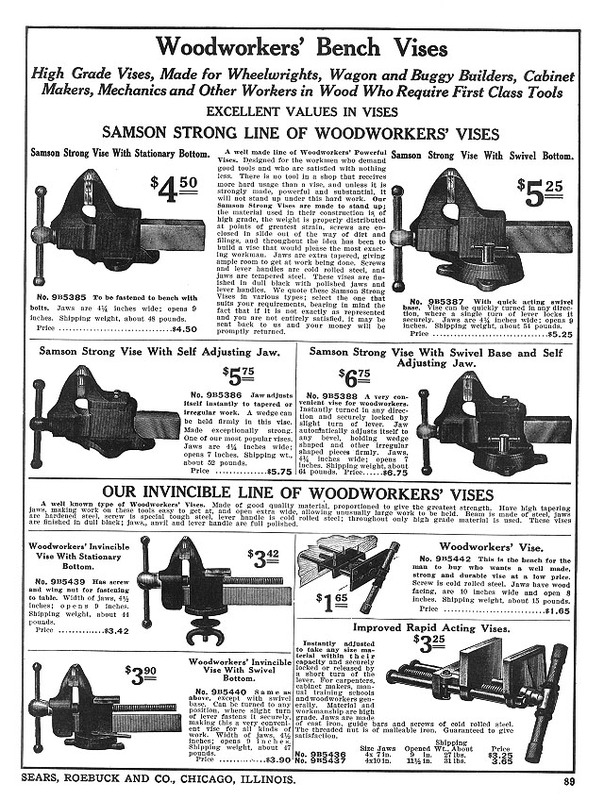 At this time more of these vises were sold without reference to the manufacturer than with. The English style blacksmiths vise, their scaling and being sold by weight had become a standard. The vise shown could be a Columbian or Iron City. However, the supplied vices could be from any American OR British manufacturer. Page 86, Parallel Jaw Bench Vises. Page 87, Parallel Jaw Specialty Bench Vises. Page 88, Combination Tool Outfits. Combination or Multi Tools were the HOT inventor's item at the turn of the century. 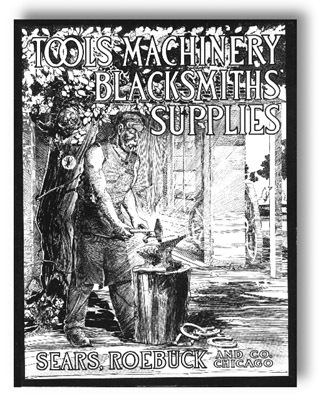 Every inventor thought they could make a better all purpose home shop machine and get rich and the thousands of foundries and ironworks found in every city of North America was willing to help the inventor produce his dream. These things rarely survive complete. The anvil being the most massive part and not requiring working mechanical parts survives most often. Page 89, Woodworkers Bench Vises. 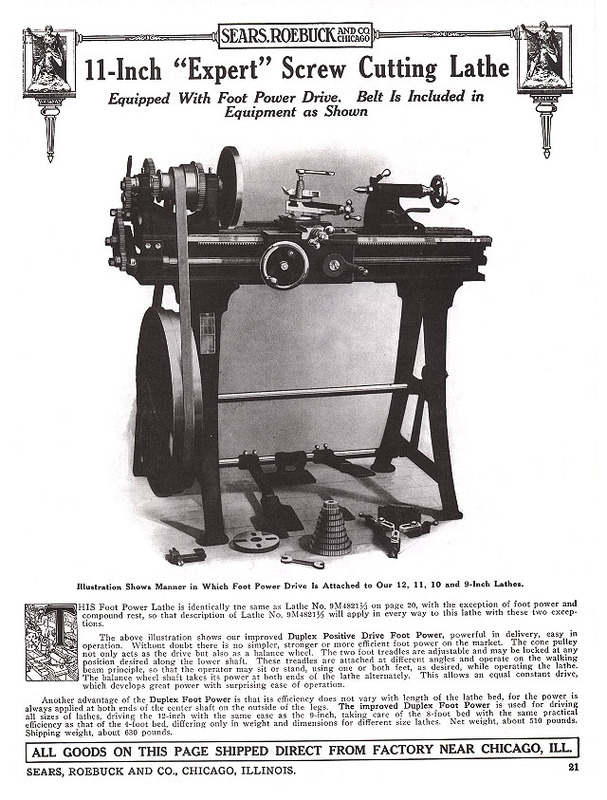 Page 21 Foot Treadle Lathe. 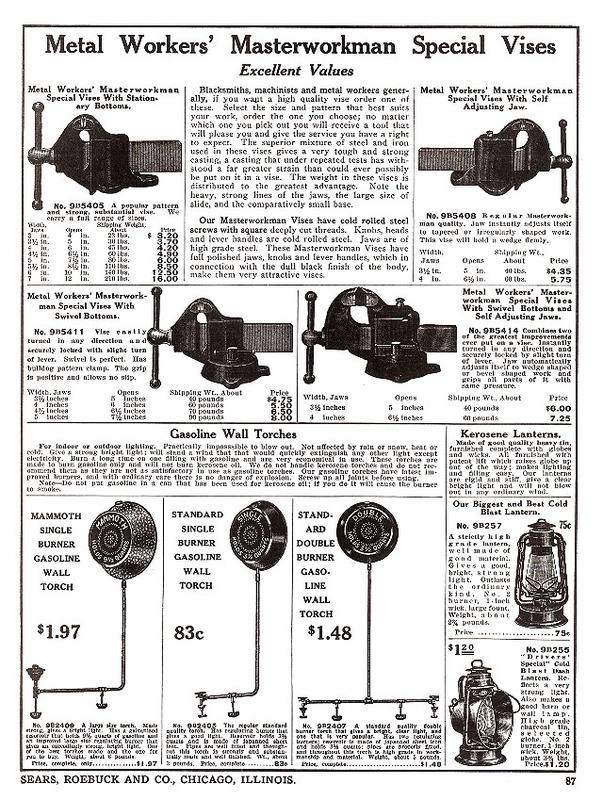 In this 1915 catalog there are more lathes advertised than forges even though it is a blacksmiths' tools catalog. This was a sign of the times, blacksmiths were expected to repair steam engines and the ever increasing number of automobiles. But another reason for the offer of so many lathes was the growth of industry had made them affordable and they had developed to a standard that would remain nearly the same for over a hundred years and probably another. The small lathe above is similar to but more advanced than the one James Nasmyth inherited from his father about 1820. He had used it as a young boy to build working model steam engines from castings he made in his bedroom. The major difference in the lathe above is that it has screw cutting capacity and automatic feeds, many invented by Nasmyth to improve his factory's tools. 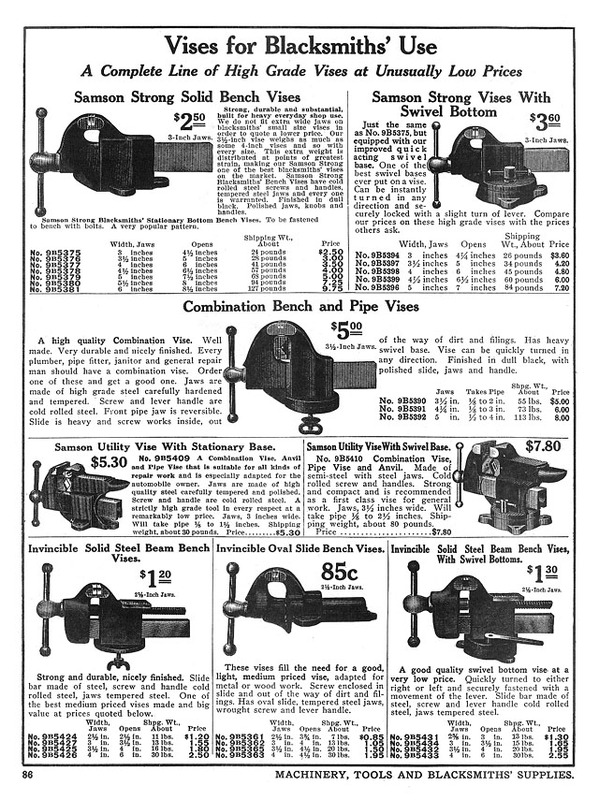 Sears sold lathes in their tool catalogs until the 1980's. Hobby lathes had lost popularity and design changes made by Atlas attempting to keep the machine's cost down resulted in a a piece of junk that was too flimsey to do good work and could not be maintained. 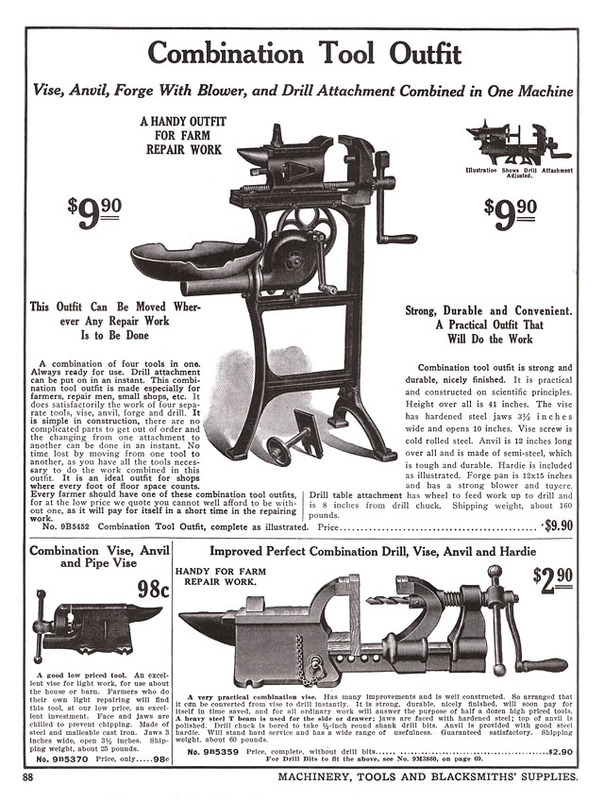 Soon after, Chinese lathes took over the hobby lathe market and a huge demand evolved for the old Sears, Atlas and Southbend Bench lathes.